WASHINGTON (Reuters): President Donald Trump vowed in his State of the Union speech on Tuesday to build a border wall, which is a source of a deep partisan divide, and said Democratic attempts at “ridiculous partisan investigations” could damage US prosperity. Trump called illegal immigration “an urgent national crisis,” but stopped short of declaring a border emergency that would allow him to bypass Congress for wall funding. Instead, he urged Democrats and Republicans to find a compromise by a 15 February deadline. Trump warned, without offering evidence, that Democratic efforts to investigate his administration, along with the possibility of US involvement in wars abroad, would endanger the US economy. “An economic miracle is taking place in the United States and the only thing that can stop it are foolish wars, politics, or ridiculous partisan investigations,” he said. His remarks came as Democrats who now control the House planned a series of probes into the Trump administration and his personal finances, while Special Prosecutor Robert Mueller investigates Russian meddling in the 2016 presidential election and possible collusion between the Trump campaign and Moscow. Russia denies meddling and Trump has said there was no collusion.Democratic Representative Val Demings called Trump’s remarks shameful and said the investigations would proceed. “We’re not going to stop,” she said. 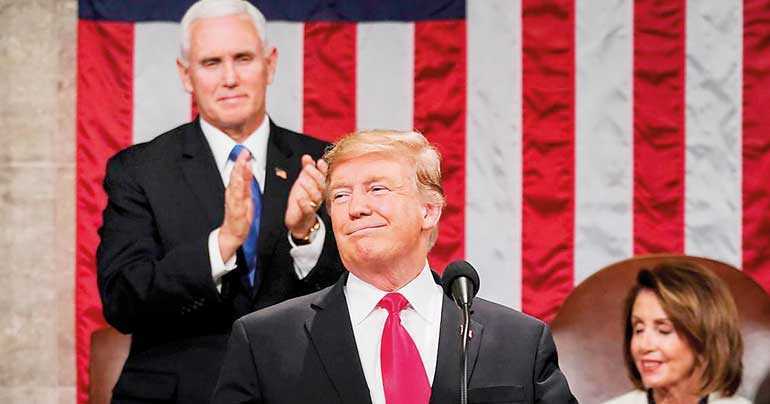 Apart from lauding economic accomplishments – unemployment near a five-decade low and manufacturing job growth among them – Trump’s speech was light on new initiatives to further stoke growth in an economy seen as losing momentum as it began 2019. Financial markets were largely subdued as Trump delivered his speech. “It was pablum, without specifics,” said Tim Ghriskey, chief investment strategist at Inverness Counsel in New York. Trump’s speech unfolded largely in a civil fashion with Cabinet members, military commanders and several Supreme Court justices in attendance at the annual presidential address to Congress. Many Democratic women lawmakers wore white to celebrate 100 years of women having gained the right to vote. Republicans cheered on the president, while Democrats grimaced or shook their heads but held their fire and applauded at non-partisan moments, such as when two Holocaust survivors were recognised.